The iPhone 7 and iPhone 7 Plus are great phones that are said to get even better battery life than predecessors. But not everyone notices that increase in battery life, and some users may feel like their iPhone 7 battery is draining a little faster than it should. Additionally, many iPhone owners may already be satisfied with how long the iPhone 7 battery lasts, but they’d like it to sustain a charge even longer. If you want to improve battery life on an iPhone 7 or iPhone 7 Plus, read on. The iPhone 7 and iPhone 7 Plus display is extremely bright, which looks great but powering that bright display can lead to battery life going down faster than you might prefer. Simply adjusting screen brightness down but leaving auto-brightness enabled is an easy solution to this. Go to Settings > Display & Brightness and adjust the brightness slider so that it’s at a much lower level, I tend to leave it around 1/3 for most usage but you can go much lower for even better battery life. 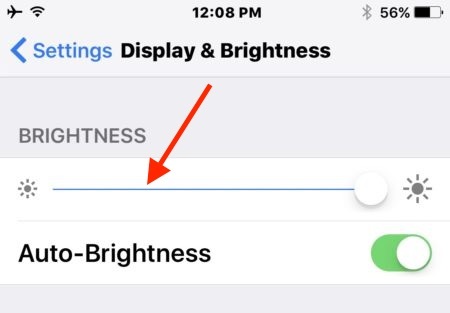 Be sure the “Auto Brightness” switch is enabled as well so that it will adjust itself up or down as needed in different lighting. 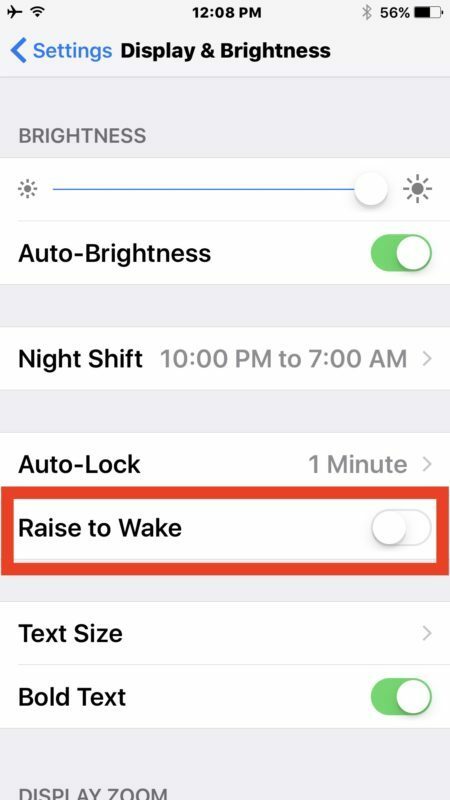 While in the same Display settings, you might want to disable raise to wake. This feature is nice in that it makes it so you don’t necessary have to press the Home button to see the screen of your iPhone, since it detects the device being raised and then wakes the screen instead. But there is a potential side effect of this behavior in that sometimes the screen wakes up when you don’t want it to. I have witnessed this with myself when using the iPhone while walking around, and I’ve seen it with a friends iPhone too, basically some particularly animated movements, exaggerated arm motions, or otherwise fairly normal motions can wake up the iPhone if it’s in your hand at the time. Turning this feature off can potentially offer an improvement to battery life since it prevents the screen from waking up in such scenarios. 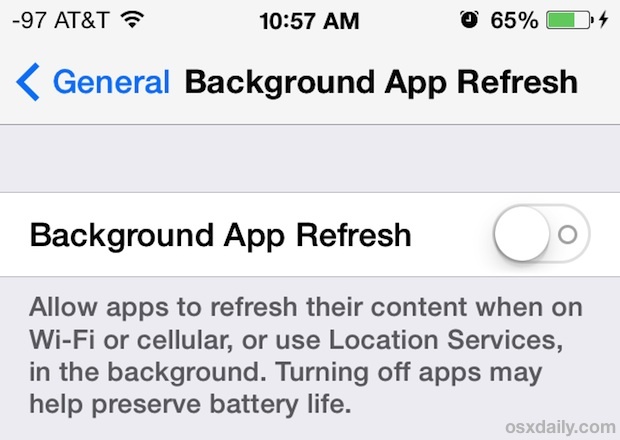 Disabling background app refresh is sort of a lynchpin of improving iOS battery life because it’s quite effective. The result is that apps don’t run in the background, updating or doing whatever they do when not in use, which can result in improvement to battery life. Go to Settings > General > Background App Refresh and turn it off. Chances are you won’t miss this feature, but if you do you can always turn it back on again and then turn it off for specific apps instead. Low Power Mode is intended to preserve battery life when the iPhone reaches below 20%, but you can enable it manually at any time. This will adjust a few features on the iPhone, throttle down the speed of the iPhone and turn off features like mail fetch (meaning you have to manually check email while it’s enabled) but the end result is dramatically long lasting battery life. You can also enable low power mode through Settings app directly, or through Siri. And yes, Low Power Mode turns the battery icon yellow while it is enabled, which should not alarm you. If you’re experiencing unusually rapid battery drain, it’s always possible some errant process has gone awry or that some other behavior is going on. Typically these are simple issues that a reboot can fix, so rebooting the iPhone may resolve such an issue. 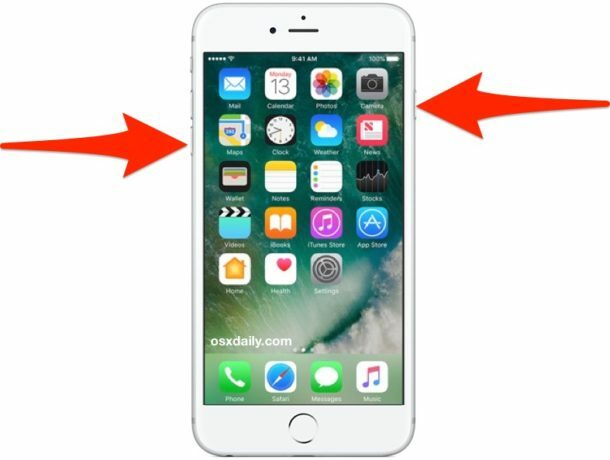 Remember, restarting iPhone 7 is a bit different, by holding the VOLUME down button with the Power button, rather than the Home button. 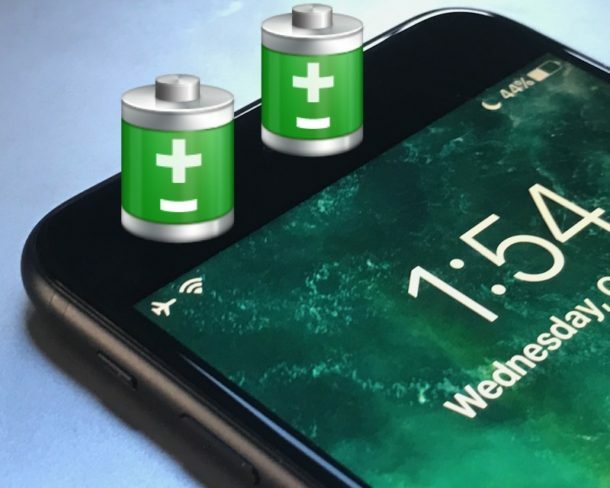 following these general battery life tips for iOS 10, you’ll find they’re all applicable to the iPhone 7 and iPhone 7 Plus as well, and just may help. Even simple stuff like cutting down on the usage of gifs, animated stickers, and effects in Messages can play a part. When in doubt, sometimes backing up and restoring can fix any particularly vexing battery issues as well. I have an iPhone 6 Plus and am experiencing the same issue. Hopefully, these tips will work. Thanks! Battery life has not been too impressive on my iPhone 7 but I think there is a bug with Background App Refresh. I turned the feature off, but I still have apps refreshing in background and allowing background activity, as it states directly in the Battery settings section. For example if you have the Uber app on your iPhone, you will find it takes a lot of battery in the background, so does Maps and Messages and Twitter and Facebook. And yes the background app feature is turned off, why is it allowed to still update in the background? I hope this gets fixed in a software update, then I expect iPhone 7 battery to be a lot better. Anyone notice that when disabling background refresh on apps that they all just occasionally get background app refresh re-enabled? Is can’t be normal right? Yes, me. I thought I was loosing my mind a few times. And, no, it’s NOT normal. I think it’s a bug, I have app refresh disabled and I go into Battery settings and all of my apps tell me there is some background activity wasting the battery. They don’t activate as long in the background though so that’s some improvement. The big battery wastes for me are Twitter, Facebook, Instagram, FaceTime, and Messages. Twitter and Facebook are probably because of the auto-play video annoyance, and I have noticed Messages eats a lot of battery from iPhone since the stickers came around, especially gifs and animated stickers. iOS is also really buggy which doesn’t help the battery situation. Overall I find my iPhone 7 battery is about 1-2 hours shorter than my iPhone 6s battery so far, kind of disappointing but I hope it evens out with a software fix. I think a bug fix is likely to resolve the situation because I believe from a technical standpoint the new battery is larger. If you turn the brightness down it helps a lot too. Yes I think there is a bug with background app refresh on iPhone 7 where the apps still run in the background despite turning it off. It’s really extreme with Uber, Twitter, Messages, Maps, etc. It is running down the battery. Check your battery app settings and you will see the “background activity” gauge is active! I think there are a few bugs in iOS 10 for ALL iPhones – battery life is abysmal post upgrade. Yes, all the usual tweaks have been made to Background app refresh, location usage, siri is off, etc etc…. Apple just announced they’re doing discounted battery replacement due to the misleading statements they made about software throttles on the newer iOS. We’ve seen several battery replacements for these devices already. Do you think your tips would still work after all is said and done?